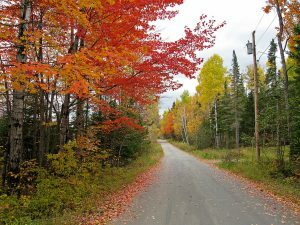 Maine fall foliage is one of the great reasons to visit the state and you should make plans to see the leaves changing color. For anyone interested in the amazing transformation in nature, there is no reason why you should not see the Maine fall foliage. These are some great ways to enjoy the views here during one of our favorite times of the year. Maine is known for having wonderful foliage during the fall. These picturesque scenes can be found anywhere in the state, from the mountains to the coast. The ideal time to visit for watching the leaves is to head to the northern part of the state in late September while the rest of the state is best viewed during the first week of October. Enjoy the leaves in state parks or out on the coast, there are plenty of opportunities as this is one of the best things to do in Maine in the fall. When planning to see the Maine fall foliage, make sure to account for plenty of time to see everything and take your time. Bring a camera and enjoy your visits through quaint New England towns and scenic coastal areas. In the southern part of Maine near York, head to the North Loop Trail at Wolfe’s Neck Woods State Park in Freeport which has great yellow colors in mid-October. Bradbury State Park has great views of forests and Casco Bay’s Calendar Islands. The park is located in Pownal. The colors are in their peak in late September to mid-October. This is also a great region to see migrating hawks. Head to Ferry Beach State Park in Saco for great views of trees and the surrounding areas. Tupelo trees turn a beautiful crimson and are in peak colors in late September into October. Maine fall foliage generally begins in mid-September in the northern part of the state. By the time it hits late September, the colors start to turn. By early October, the colors have really turned in central and southern Maine. Many of the state parks offer great scenic views and can make for amazing scenes to capture in photos to have memories for a lifetime. Maine fall foliage is a great reason to visit the area and experience various York attractions. There is no reason why you should not book a vacation. To ensure you see everything, make sure to book a stay at Dockside Guest Quarters so you enjoy them all. Not only do the accommodations offer timeless style combined with modern comforts, but when you stay you also get breakfast from our bountiful buffet each morning, ensuring that your days will start off on the right note. Our Dockside Restaurant is perfect for a great meal. For an all-around good time in coastal Maine, stay at Dockside Guest Quarters. We can’t wait to see you soon! Maine fall foliage is one of the best reasons to visit the area. Be sure to check out more fun things to do in York, Maine!